"Dimples" or "Little curly top"-- by any name Shirley Temple enchanted audiences during the Great Depression and is still a classic favorite today. A movie star at the age of four who could dance and sing like no other, Shirley performed with some of the silver screen's greatest stars and remains an American icon. At left is a still from POOR LITTLE RICH GIRL (1936). 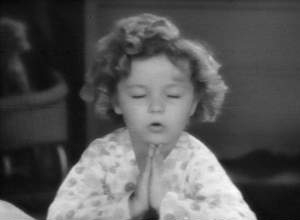 As Shirley Blake saying her prayers in BRIGHT EYES (1934), the film in which she sang what was to become her signature song, "The Good Ship Lollipop" (which, by the way, was an airplane). 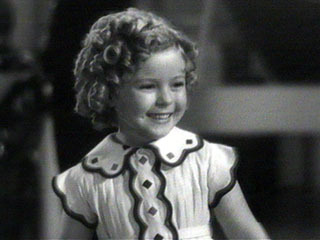 At the age of six, Shirley received a special Academy Award "in grateful recognition of her outstanding contribution to screen entertainment during the year 1934." She had made nine films that year, and the special juvenile Oscar she received for her work made Shirley the youngest person in the then-short history of the Academy Awards ever to receive an Oscar. It is a distinction she still holds more than 70 years later. 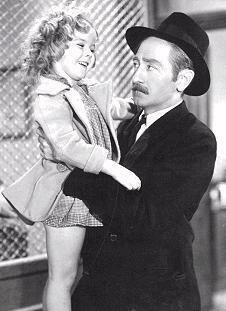 With Adolphe Menjou in LITTLE MISS MARKER (1934). As the story goes, Menjou was having trouble on the set one day with one of his lines. At the prompting of a few crew members, Shirley asked director Alexander Hall, "Is it too late to replace Mr. Menjou on this picture?" 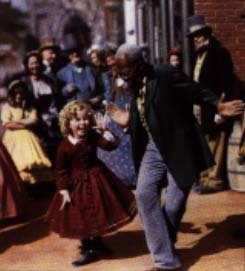 Dancing with Bill Bojangles Robinson in THE LITTLE COLONEL (1935), the story of a little girl in the Old South who helps heal the bad blood between her mother and her crotchety old grandfather (Lionel Barrymore). THE LITTLE COLONEL features Shirley's famous dance on the stairs with Robinson, marking the first of four films in which they would dance onscreen together. And although THE LITTLE COLONEL is black-and-white, original prints of the film feature the final scene in Technicolor, as was often done in the early days of color films. 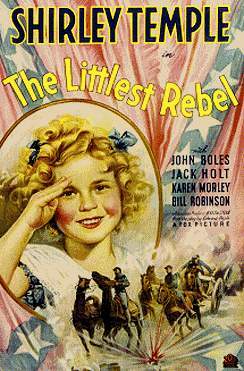 A poster from THE LITTLEST REBEL (1935), another story set in the Old South and featuring memorable dancing by Shirley and co-star Bill Bojangles Robinson.